I ♥ Motherhood: Listography - 1st 5 Albums I Ever Owned! This weeks Listography from Kate at Kate Takes 5 is a real admission of taste - the 1st 5 Albums I ever owned. Here goes and I can already hear you sniggering! 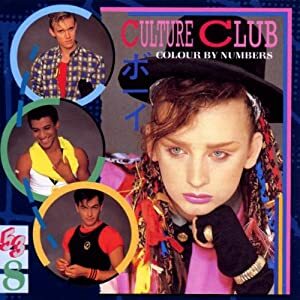 I got this album for my birthday when I was 8 and I didn't just have the ordinary record - I had the picture disk and I loved it - it was one of my prized possessions and I would look at it over and over and also do lots of drawings of Boy George - I loved him, and had no inkling at all that he was gay! I obviously loved Karma Chameleon but loved "Church of the Poison Mind" - the real talent on that song was the female backing singer, Helen Terry. I got this on my birthday in December 1984 - I remember it so vividly because that morning before school my mum and dad had, had a row. I wasn't too disturbed by it but I think my Dad felt so bad about it being my birthday and the atmosphere that was created in the house in the morning that when he came home from work he was armed with an 'Our Price' bag with 2 shiny new tapes in it!! I was very excited. I got this and the Wham one below. I have my Dad to thank for me loving Madonna for many years after this. I really was too young at 8 years old to know what I was singing about when droning along to 'Like a Virgin' but I loved it! I loved all the lace, the beauty spot and her style. I don't remember who bought me this, but I still love Spandau Ballet and found the Kemp brothers fascinating and Tony Hadley's voice was so powerful. True, Gold - who can resist singing along to those powerful songs?! My final admission is the Wham boys. Again, I had no inkling that George Michael was gay. I also harboured wished that Madonna would get it together with him. I could see no better pop match! I knew that Andrew Ridgely was the nobody in the group. I only had eyes for George. I loved the Last Christmas video with Pepsi and Shirley too, thought it was magical. And so that brings me to the end of my Listography, I've enjoyed re-living the memories! Love your list! Bucks Fizz's first entry - you should be very proud! lol - great picks - I loved Culture Club and Spandau Ballet. And I still remember the night that Bucks Fizz took the world by storm at the Eurovision Song Contest (I'm a few years older!). But I think my first album was Showaddywaddy sp? so not nearly so cool as you!